Participants of the Workshop on Dynamic Structural Photocrystallography in Chemistry & Materials Science. 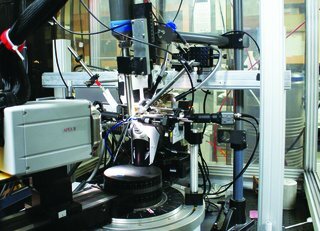 Photocrystallography combines X-ray diffraction with external light excitation of the sample. It is utilized for studying out-of-equilibrium phenomena in crystals, i.e. relaxation processes, long-lived metastable states, short-lived excited states and solid-state photochemical reactions. The rapid development of techniques and the availability of pulsed synchrotron X-ray sources have brought photocrystallography to the frontier of modern crystallography. It is now possible to conduct time-resolved studies of species with microsecond or even shorter lifetimes. Recent advances in the field show not only its potential and importance but also the need to train students and young researchers in the subject. This workshop was initiated and organized by Philip Coppens (USA), and supported by members of his research group. The International Advisory Committee included E. Collet (France) and M. Takata (Japan). 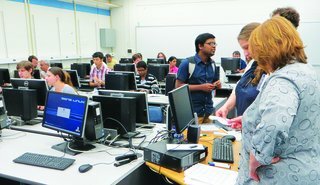 Fifty-five scientists, graduate and undergraduate students, young researchers, and invited speakers from American, European and Asian universities and research centers participated in the workshop. Left corner: the in-house pump-probe photocrystallography instrument. Light-induced processes such as photochemical reactions, linkage photo-isomers and photo-induced molecular excited states in crystalline solids – on timescales of hours to femtoseconds – were studied during the workshop. Development of experimental laser pump/X-ray probe techniques, used either for in-house experiments at high-intensity X-ray sources or for experiments performed at synchrotron beam lines or at free-electron laser sources, was a major focus. New computational techniques for time-resolved data processing and interpretation of results were also considered. The workshop program was divided into two parts: an opening lecture by Philip Coppens and plenary lectures given by P. Naumov (NYU Abu Dhabi & U. of Kyoto), J. Benedict (U. at Buffalo, SUNY), E. Collet (U. of Rennes, France), A. Makal (U. of Warsaw, Poland), M. Messerschmitt (SLAC National Accelerator Laboratory), J. Spence (Arizona State U.) and F. Schotte (NIH, NIDDK). Software exercises followed. The second part had three tracks: (1) Monitoring Chemical Reactions; (2) Pump–Probe Experiments of Excited State Structure (E. Trzop, A. Makal and B. Fournier), and (3) Treatment of Liquid-Jet Injection LCLS Data With Examples by N. Zatsepin (ASU). Manufacturer presentations were given by C. Ceccarelli (Agilent), L. Daniels (Rigaku) and C. Campana (Bruker AXS) on potential applications of commercially available X-ray diffraction systems for studying light-induced phenomena. Thanks to support from the IUCr, travel grants were awarded to six young scientists.